On Pentecost Sunday there will be an information day to familiarize the congregation about different organizations that help people locally, in Canada and around the world. SCAW will be there. Stratford vet Doug MacDougald recently returned to his home in Stratford following a mission of mercy in Mumbai, India. He travelled as part of a team of volunteers representing the registered Canadian charity Sleeping Children Around The World. The team distributed 7,500 bed kits in the area near Mumbai. All members of the team travelled at their own expense and without benefit of a tax receipt so the charity could fulfil its pledge to each of its donors that every penny of each $30 donation would be used to provide the items that the children received, states a press release. Hockey legend Murray Dryden and his wife Margaret registered Sleeping Children Around the World in 1970 and to date the organization has delivered over 865,000 bed kits in 31 Third World countries. The bed kit distributed in Mumbai included 20 different items intended to provide each child with a peaceful night's sleep and improved personal hygiene. All bed kits contained the same items including such things as: a sleeping mat, a cotton blanket, a wool blanket, a pillow, a towel, clothing (two sets), a sweater, a raincoat and a school bag. Sleeping Children Around The World is a Canadian international not-for-profit organization dedicated to providing bedkits to children of any race and/or religion living in underdeveloped and developing countries. SCAW works with reliable overseas partners who arrange for all items to be made in the country of distribution. The Rotary Club of Mumbai was the partner for this distribution and fulfilled rigorous financial reporting to account for all expenditures. This overseas partner also assisted in the selection of the neediest children. Don Potter struggles to put his experience into words. He says, “I don’t know how to start my report since so much is going through my mind”. This is often the feeling that traveling volunteers articulate when they try to capture the strong emotions of a distribution for the Canadian Charity, Sleeping Children Around the World. Don has recently returned from Kenya Africa. He saw slums where poverty is endemic. He now understands the threat of disease to these innocent children. He now better understands how it is possible that a child in Africa under the age of five dies every 30 seconds from malaria! Don wrote about a child he encountered in the first distribution. 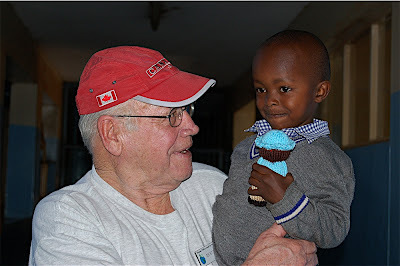 This child was deaf and badly disfigured but he reached out to Don with a smile of uncontained happiness. Sleeping Children Around the World is an exemplary Canadian Charity that pledges that every penny of a $30.00 donation will be invested in the bedkit. The six person team that traveled to Kenya paid all of their own expenses! Murray and Margaret Dryden, parents of hockey legends Dave and Ken Dryden, registered this Charity in 1970 and to this date this unique organization has delivered over 869,000 bedkits in over 30 different third world countries. Sleeping Children Around the World works with reliable overseas partners who arrange for all items to be made locally. In Kenya, the Rotary Club of Nairobi performed this valuable service. They account for all expenditures and assist in selecting the neediest children. For more information please contact Tamara Kaftalovich, Account Executive, Maverick Public Relations Inc. @ 416-640-5525 or Grant Clark, Sleeping Children Around The World @ 416-231-1841. 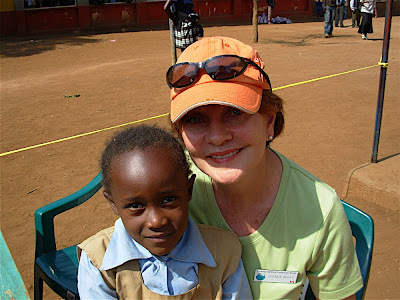 Brenda Oliver, who is a traveling volunteer for the Canadian Charity, Sleeping Children Around the World, characterizes the slums of Nairobi, Kenya in a most poignant fashion. She writes that “we witnessed the children living in deplorable conditions…no running water…unsightly garbage strewn everywhere…open sewers…” Brenda and her team mates, four of whom are from the Toronto area, now better understand why an African child under the age of five dies every thirty seconds from malaria! This team of volunteers distributed 4000 bedkits to impoverished children in Kenya Africa. These bedkits contained not only desperately needed bedding items, but also an insecticide-treated mosquito net. Sleeping Children Around the World is an exemplary Canadian Charity that pledges to its donors that every penny of a $30.00 donation will be invested in the bedkit. The six person team that traveled to Kenya paid all of their own expenses. Mr. Murray Dryden and his wife Margaret, parents of legendary hockey stars Dave and Ken Dryden, registered this Charity in 1970 and to this date this unique organization has delivered over 869,000 bedkits in over 30 different third world countries. Sleeping Children Around the World works with reliable overseas partners who arrange for all items to be made locally. In Kenya the Rotary Club of Nairobi performs this valuable service. They account for all expenditures and assist in the selection of the neediest children. DUNSFORD - Vic Wilbee is helping children around the world sleep better. For four years, the Kennedy Bay Road resident has been collecting aluminum beverage cans for Murray Dryden’s Sleeping Children Around the World. Dryden learned first hand how vital a few hours of comfort and sleep could be in battling extreme temperature, hopelessness, illness and hunger when he travelled east from Manitoba seeking work during the Great Depression of the 1930s. That experience later made him determined to ensure a good night’s sleep is a basic right of every child. It led him to develop Sleeping Children Around the World with his wife, Margaret, in 1970. A retirement project, they decided to provide bedkits first to 50 children in India. The concept quickly grew and became their life focus. Since its founding, Sleeping Children has raised more than $17 million to provide bedkits for more than 700,000 children in 31 developing countries. Wilbee admitted he has a long way to go before he’s able to fundraise to that extent, but he’s honoured to do his part. Last year, with the help of family, friends and neighbours - as well as generous strangers who learned of the project by word of mouth - Wilbee raised $3,000 by collecting aluminum beverage cans. Considering each can is worth one-and-a-half cents, that’s pretty impressive. “It sounds like a lot, but it’s amazing how quickly it adds up,” he noted. Learning of the Drydens and their work from an acquaintance, Wilbee thought it was such a great cause he decided to get involved. With everyone’s help, Wilbee said it’s not long before his bins fill up with a variety of aluminum beverage cans. Wilbee also takes cast aluminum barbecues and almost anything else made of aluminum, copper or brass. He has recently added the large metal satellite dishes and scrap cars to the list - the latter of which is split with Sleeping Children to cover towing and incidental costs. Wilbee said every little bit counts. “Four years ago, I collected $300 worth of aluminum beverage cans and I thought that was great,” he said, noting each $30 donation (Canadian) provides a bedkit of a mat or mattress, pillow, sheet, blanket, mosquito net (if applicable), clothing outfit, towel and school supplies. Kit contents vary from country to country depending on local needs. Individuals and groups are urged to save their aluminum beverage cans and put them in clear plastic bags. They can drop them off in Wilbee’s 18 Deerwood Ave. driveway or call him at 793-9955. People can also e-mail Vic. Those donating scrap cars or unwanted satellite dishes - which are dismantled and sold for scrap metal just like the cans and cars - are asked to call Jim Foster at 793-2004. For more information on Sleeping Children e-mail SCAW. Doug Macdougald can now reflect upon his experiences in Mumbai, India. He vividly remembers 7,500 beautiful children! Some had never been in a vehicle before. Many had never had their picture taken or had never seen a person whose skin was white! They were often cautious, shy and afraid. These children, through no fault of their own, were trapped in a cycle of poverty where their families subsisted on less than a dollar a day. Doug also witnessed their joy when they received a bed kit – a gift made possible through the charitable work of an organization named Sleeping Children Around The World. Sleeping Children Around The World is an exemplary Canadian Charity that pledges to its donors that every penny of a $30.00 donation will be invested in the bed kit. The five person team that traveled to Mumbai paid all of their own expenses! Sleeping Children Around The World works with reliable overseas partners who arrange for all items to be made in the country of distribution. In Mumbai, the Rotary Clubs performed this valuable service. They account for all expenditures and assist in the selection of the neediest children. Richard and Joan Hryniw have just returned from Chennai, India where they completed another distribution of 5,000 bed kits on behalf of the Charity that they love! SLEEPING CHILDREN AROUND THE WORLD has become a passion in their lives. They have been on many trips and are proud to represent this exemplary organization. Richard and Joan will tell you that this Charity insures that each bed kit arrives in the hands of a deserving child because a traveling volunteer personally places it in these small but appreciative arms. They will proudly announce that every penny of each $30.00 donation is spent on the contents of the bed kit because traveling volunteers pay all of their own expenses. They will reassure donors that all funds that are transferred to our overseas partners (often Rotary Clubs) are subject to a detailed financial report to guarantee that all expenditures are held to very strict account. But most of all they speak about the children. SLEEPING CHILDREN AROUND THE WORLD was registered as a Canadian Charity in 1970 by Mr. Murray Dryden and his wife Margaret, parents of legendary hockey stars Dave and Ken Dryden. To date this unique Charity has raised in excess of 20 million dollars and distributed bed kits to 869,550 children in 31 different third world countries. The bed kit distributed in Chennai contains 23 different items intended to provide each child with a safe and peaceful night’s sleep. Recently a mosquito net has been included in the bed kit to keep the children safe from malaria! 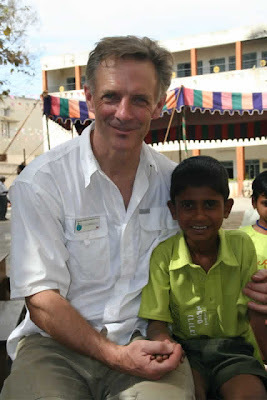 Tom Chudleigh has recently returned to his home in Milton, Ontario from an exhilarating experience in Kolkata, India. Tom traveled as part of a team of six volunteers representing a registered Canadian Charity called Sleeping Children Around The World. This team distributed 6500 bed kits in the area near Kolkata, India. All members of the team traveled at their own expense and without benefit of a tax receipt so this Charity could fulfill its pledge to each of its donors that every penny of each $30.00 donation would be used to provide the items that the children received. Mr. Murray Dryden and his wife Margaret, parents of legendary hockey stars Dave and Ken Dryden, registered this Charity in 1970 and to date this unique organization has delivered over 865,000 bed kits in 31 third world countries. Sleeping Children Around The World works with reliable overseas partners who arrange for all items to be made in the country of distribution. The Rotary Club of Kolkata was the partner for this distribution and fulfilled rigorous financial reporting to account for all expenditures. This overseas partner also assisted in the selection of the neediest children. There will be a concert of sacred and secular music performed by The Chancel Choir of St. James United Church, under the direction of Clive Dunstan Mus. Bac., A.R.C.T., C.R.C.C.O. With Special Guest Pianist: Annie Zhou, Age 8, and winner of the RCM Scholarship. Don't miss this opportunity to treat your mother on Mother's Day to a wonderful concert and support a charity which aids thousands of underprivileged children of the Third World, through the dedication of Canadian volunteers. It refers to the article mentioned here earlier. One of the most striking details of the story we ran last week on Doug MacDougald and Sleeping Children Around the World (SCAW) didn't actually get much mention in the piece. The structure of the charity is designed to make sure absolutely every penny in donations towards bed-kits goes towards bed-kits. When a volunteer at SCAW's head office – a brown brick bungalow in Toronto – goes out to buy stamps, the money for those stamps comes from a completely segregated revenue stream. Operating expenses (stamps, phone bills, that sort of thing) are 95% paid for out of investment income. When you send a cheque to SCAW, it either goes into the the operating account or the bed-kit account, and never the twain shall meet. It's an interesting model because it's so austere. Everybody buys his or her own plane ticket, and if there isn't enough money to buy toner for the photocopier this month, there simply isn't any way to get it from the bed-kit account. Knowing that it's easy to spend (and waste) other people's money, the Dryden family, of Toronto, have built a group that does the most possible good with the least possible opportunity for graft. The disadvantage of this model lies in the independence of the organization. Non-profits that don't take government money, don't pool resources, don't broadcast their message with costly, sophisticated ad campaigns, and don't hire specialized administrative staff are very little fish, indeed. Given the demands on the average donor's attention, the constant hectoring of disease lobbies and foreign aid groups and environmental advocates and so on, it's hard to imagine any kind of fair distribution of money to the best causes. When charities "raise awareness", they are really trying to raise awareness of their cause higher than awareness of other causes; otherwise, they won't get your support. This leads to a kind of shouting match. Hardly the best way to choose how we allocate our "greater good" resources. The alternative, of course, is to pass off responsibility for prioritizing charitable spending to someone who we believe is an expert, a professional. Just give the money to the government or the United Way and let them sort it out. They do this stuff all day, after all. And the downside here is bloat, waste, petty corruption, and loss of control on the part of the individual donor. So pick your poison, I suppose. Still, the Drydens have done something pretty special, it seems to me, and it is hard to imagine a way to give money that would provide more good per dollar. Article published in The Compass, Trinity and Conception Bays, Nova Scotia on May 8, 2007"
Tens of thousands of children around the world are getting a more comfortable night's sleep, thanks to the inspiration and generosity of one man. Murray Dryden may not be as well known across Canada as his hockey legend son, Ken, who went on to a political career as a federal cabinet minister and candidate for leadership of the federal Liberal party. But the elder Dryden will long be remembered as the founder and driving force behind an organization, which, for 37 years, has been helping disadvantaged children around the world. Murray Dryden, founder of Sleeping Children Around the World came from humble roots, having grown up on a small farm in Manitoba. As a young man, his desire to become independent saw him leave home. But instead of heading west, he headed east. After more than two years of travel, he would end up in Toronto, a journey that, under normal circumstances, would have taken a matter of days. But this was the early 1930s - better known as the dirty thirties - the years of the Great Depression, when abject poverty was rampant and the road to anywhere was a rough one. Gwen Morris of Harbour Grace will never forget meeting Murray Dryden in 1989. Impressed by how "down to earth" Dryden was, Morris was also inspired by his strong dedication and commitment to the cause he was championing. Last Monday, April 29, the soft-spoken Harbour Grace woman came to the Carbonear Memorial Library to speak to members of the Harbour Grace and Carbonear Library boards about Dryden and the organization he founded. Recounting his first journey from home, she told the group: "Most nights he slept anywhere but in a comfortable bed. Very seldom having a good meal, he sometimes went for days without anything to eat. Most of the time, all he had was the clothes on his back." But in Toronto, he worked hard to get on his feet and build up a successful construction business. Eventually, his success would allow him to travel the world. In 1970 while travelling in Pakistan, Murray Dryden stumbled over a child sleeping in a street. According to a volunteer worker with his organization, the image of that child was to grow and become the focus of his and Margaret's (his wife's) retirement years. The image of that sleeping street child must have reminded Dryden of his own humble beginnings at home in Canada. He once said: "There is nothing more peaceful than a sleeping child." When he retired in 1972, Dryden devoted all his time and energy to Sleeping Children Around the World (SCAW), the new Canadian charity he and his wife had launched two years earlier. The organization's main focus is to provide bed kits to children around the world, who do not have a place to put their heads at night. The bed kits include: a mattress, blanket, pillow and pillow cases, a toy, two sets of pyjamas, pencils, paper and a carrying bag. Sometimes, depending on the location, other items such as mosquito nets may be provided, if they are needed. The organization works in third world countries where kits are distributed, through churches, the Salvation Army, and service clubs like Rotary, YMCA and Kiwanis International. It was through Kiwanis that Gwen Morris first met Murray Dryden. Gwen's late husband, Frank, was a past president of the Kiwanis Club of Carbonear and Governor of Kiwanis for Newfoundland and Labrador. They met Dryden at a Kiwanis International convention in 1989. Children in India, Indonesia, Portugal, the Philippines, Columbia, Argentina, Thailand and Honduras have all benefitted from the bed kits provided by Sleeping Children Around the World. While the donations to provide the bed kits come from Canada, the kits themselves are actually made up in the countries where they are being used - providing much needed employment there. The numbers of kits distributed on each trip can vary from 1,000 to 11,000. Some 5,000 bed kits were distributed to needy children in Kenya in March of this year, bringing to 869,850, the total number of kits provided since the organization was launched. Recalling that when he started the organization, Murray Dryden's goal was to provide a million bed kits to needy children, Gwen Morris said last week, "they are getting close to reaching his goal." One woman who helped distribute bed kits in India said: "There is such a huge quantity of unconditional love that accompanies each gift of a bed kit, that to be part of a recent distribution was a very healing experience for me." In the early 1970s, when the organization was launched, the bed kits could be provided for $15 each. Now inflation has doubled that cost to $30, which Gwen Morris says, is still not a lot for people who live here in Canada, where we have so much, compared to those who live in third world countries. When they started their worthy cause, she said, "the Drydens were determined that not one cent from donors would be used for administration." Murray Dryden wrote three books: With God Nothing is Impossible, For the Love of His Children and his autobiography. All proceeds from these works went towards SCAW. He also started three Christmas tree farms, the profits from which also go to the worthy cause. To underscore how passionate Dryden felt about SCAW, he travelled extensively and spoke prolifically about his cause - up to as many as 30 speaking engagements in a single month, and some 257 presentations in one year (1990). In 1988, Murray Dryden received the Kiwanis International Service Award of $10,000, which he promptly turned over to SCAW. After devoting the last 34 years of his life to the cause, Murray Dryden died in 2004. He was 94. But for anyone who thought it impossible to give any more to any cause after one's death, the Drydens' family home was recently turned over to Sleeping Children Around the World. After speaking at the Carbonear Library last week, Gwen Morris presented copies of Dryden's book, For the Love of His Children to the Carbonear and Harbour Grace public libraries. The books were donated in memory of her late husband, Frank Morris. While most of the volunteers come from Ontario, donations come in from all over the country. Sleeping Children Around the World is an organization not very well known in this province. Indeed most of those who attended last week's talk had never heard of it. But Gwen Morris feels so strongly about the organization and its work, she is willing to speak to church and community groups and do anything she can to help spread the word. "I think I've got some of the passion Murray Dryden had for it," she says. A Stratford veterinarian says spending more than two weeks in India distributing 7,500 bed-kits to children in the area around Mumbai (Bombay) has taught him lessons he won't soon forget. Doug MacDougald, who, with four other Ontario volunteers, returned from India in February, told Inside Stratford/Perth, "We all know intellectually what conditions are like in places like India; we've all seen pictures, on television, in the newspapers. But in interacting with the people, and especially the kids, I feel I've come to know it emotionally. It's a very humbling experience, and the feeling of having gained a much broader perspective still hasn't faded from me." The volunteers oversaw the distribution of bed-kits, each comprised of a sleeping mat, pillow, blanket, quilt, towel, lunch box, water bottle, rain coat, two sets of clothes, and a full complement of school supplies, on behalf of Sleeping Children Around the World (SCAW). The charity was founded in 1970 by Margaret and Murray Dryden, the parents of politician and NHL goaltender Ken Dryden. "I'm at a stage in my life where I'm looking to do different things, find different purposes," MacDougald said, "ways I can give my time and my energy." He talks about his parents' many years of involvement with SCAW, and the steady stream of photos of children receiving bed-kits their donations in his name, in his children's names, and latterly in his grandchildren's names, have brought in the mail. His trip to India continues his family's decades-long connection with the subcontinent: his parents have always designated their bed-kit donations for children in India, Bangladesh, and Sri Lanka, in large part because his father was an RCAF officer stationed in India during the Second World War. He went on to talk about some of the children he met. The distribution, he said, targeted children between 6 and 12 years old, and the children had been selected from area schools. Their parents, guardians, and grandparents, he said, were "auto-rickshaw drivers or construction workers, many, many of them making less than a dollar a day. They're making bricks, working in agriculture, or in textiles." He mentioned a road crew he saw on one of the volunteers' drives through the countryside: "Even in road construction, everything is manual labour. There was a crew of men ditching beside the road, and they were digging the ditch with their hands." India has an abundance of people willing to work, he said, noting that "There is a huge demographic bulge. More than 50% of the 1.2 billion people there are under 25 years old." And in spite of SCAW's good work, there are always more children who need a bed-kit than can be reached. MacDougald recalled one distribution at a school next to a brick yard. "There were these three little girls standing off to one side, among the bricks, watching, interested; but they didn't go to school." Because the selection of needy children had been done in partnership with local schools, kids like these simply remained invisible. But what struck MacDougald was the children's cheerfulness in the face of poverty, their "big smiles, excited play, and happiness in simple things." SCAW's philosophy places a heavy emphasis on free-will giving and minimal administrative overhead. The organization says its financial structure and reliance on volunteers, in Canada and abroad, ensures that every penny of the $30 it takes to supply one bed-kit is spent on that bed-kit's contents. Overseas partners take care of the actual purchase and distribution of bed-kits. In MacDougald's case, the primary partner agency was the Rotary Club of Mumbai, which co-ordinated the efforts of 55 local Rotary Clubs in the surrounding towns and villages targeted in this distribution. Rotarians sourced all of the items in the bed-kits from domestic companies, selected local children in need of assistance, and organized distribution dates and sites. Producing the bed-kits in India cuts costs; as MacDougald put it, "You can get a lot more for $30 there." The kits also don't have to be shipped as far, and the substantial sum of donated money that pays for them stays in India. Just as SCAW relies heavily on administrative volunteers and partner charities to keep overhead low, it doesn't subsidize the work of people like MacDougald. He paid for the trip himself; and, because SCAW's mandate excludes contributions from governments, he had to do it without a tax receipt. But that doesn't seem to stop people from signing up: "There's actually a waiting list" for SCAW's travelling volunteers program, MacDougald said. As for himself? "I've only been back for a couple of months, and I've already told them I'd be interested in going again." You might also want to read a Commentary — May 11 which said more about Sleeping Children Around the World. We're the second item. MusicFest 2007 — Oh CANADA! Presented by St. John’s Yorkmills Anglican Church at 19 Don Ridge Drive, Toronto (Near Yonge & York Mills subway). A light-hearted concert that looks at the artists and music of Canada with audience participation. Featuring our handbell and vocal choirs, ‘ugly sticks,’ and guest fiddler Christopher Jääskeläinen. Proceeds to benefit Sleeping Children Around the World, Street Outreach Services & St. John’s.